Hope will transform into a small town in Oregon this week, for the shooting of a horror-thriller film directed by Scott Cooper and produced by Guillermo Del Toro. The Midtown Shopping Plaza was the main filming area Monday, with Baker’s Books becoming Harlan’s Bookstore, Kan Yon Restaurant transforming into Cispus Falls Chinese Restaurant and an empty business on the corner turning into Mr. Finn’s Ice Cream Shoppe. The crew also temporarily halted traffic as filming took place along 3 Ave. and Wallace St.
“A small-town Oregon teacher and her brother, the local sheriff, discover that a young student is harboring a dangerous secret with frightening consequences,” a news release by Fox Searchlight Pictures stated. The cast features Keri Russell (The Americans, Felicity) as the teacher, Jesse Plemons (Hostiles, The Post) as the sheriff and Jeremy T. Thomas (Lore) as the young student. The film also stars Canadian actor Graham Greene (The Green Mile, Wind River, Dances with Wolves). Antlers is being shot entirely in the greater Vancouver area, said Silbermann. 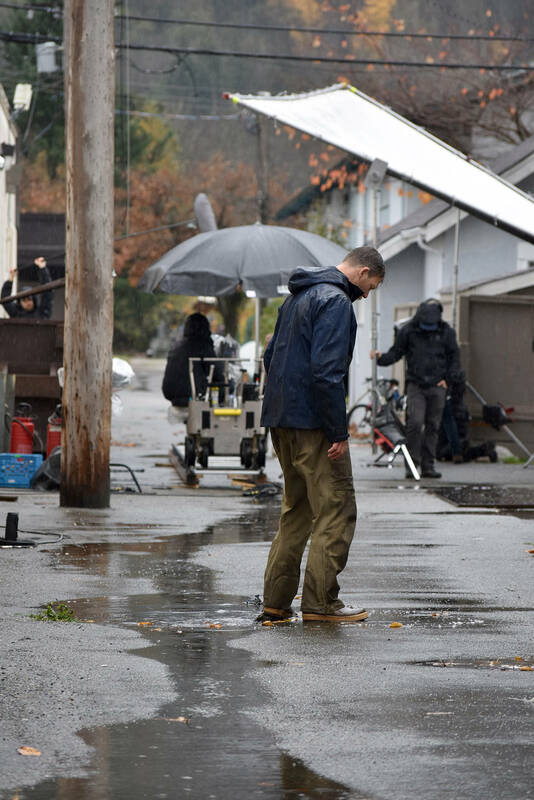 The crew of 120 began with two days of filming in the pouring rain at the site of Coquitlam’s Riverview Hospital, then moved on to among other locations Squamish, Brackendale, Port Moody, Alouette Lake and the Blieberger farm in Langley. Silbermann said director Scott Cooper fell in love with Hope as a locale for the neighbourhood where the teacher and her brother live, in Cispus Falls, Oregon. “The town just looks perfect, it really does suit our story and Hope has been in a lot of movies,” he said. The cast and crew are staying overnight in various hotels and so far, the community has welcomed them said Silbermann. “The community has really been wonderful and accommodating and that’s always the key,” he said. After location filming, the production will move into a Burnaby studio for three weeks. Scott Cooper (Crazy Heart, Black Mass) directs the film, in what is his first foray into the horror genre. Antlers is produced by Guillermo Del Toro (Pan’s Labyrinth, Hellboy, The Shape of Water) with producers David. S. Goyer, J. Miles Dale, and executive producer Kevin Turen. Writers are Nick Antosca and Henry Chaisson, with revisions by Scott Cooper. The story is based on a short story by Antosca called The Quiet Boy.